It was another weekend with lots of rain and tornados here. Some people living close to the river had to be rescued. Luckily I live on high ground. Then in a little bit of irony, some construction workers hit a water main in one of the adjoining towns. Even the hospital was without water for a most of the day. It was a good weekend for staying inside and looking through old photos. 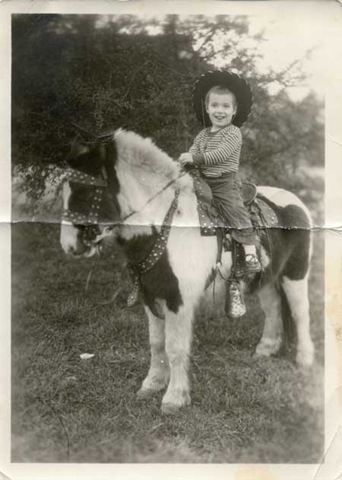 I came across this photo of me as a kid on a pony. It’s one of my favorite photos. I’m not sure how old I was. I know my family always said I didn’t start growing any hair on my head until I was about two years old. (Trust me, I’ve made up for it since then.) I remember a man came through the neighborhood with a pony offering to take pictures and how excited I was. All of this is a blatant attempt at distraction from my accident-prone self these days, at least when it comes to glass. I broke my glass coffee pot today. This is my second one in little over a month. Maybe I should consider getting something in stainless steel next time. Then on my way to work about a week ago, a car making a turn kicked up a rock that made a ding in my windshield. It wasn’t too bad, though, and looked fixable. Luckily I didn’t do anything about it because this week another car kicked up another rock at almost the same spot in the road. Except this time, it hit at the edge of the windshield and caused a major crack. (whimper) I think I’ll try to avoid anything made out of glass for a while. I think someone should invent clear rubber windshield. Don’t do it, Clyde! 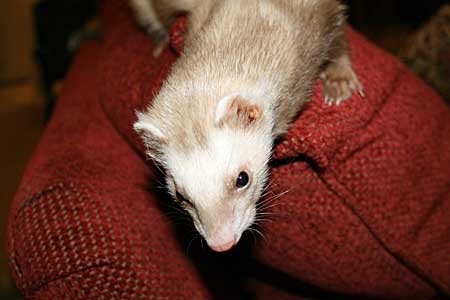 I don’t think ferrets are as good as absorbing jumps as kitties! Oh, dear, about the glass. 😦 Stainless coffee pot’s sounding like a good plan. I make espresso, so it brews into a little stainless cup. Whew. So sorry about your recent experiences! Ouch! We have a lot in common, I too was bald until around 2 years old, now I have a head full of thick hair! Also, glass isn’t a friend of mine, I ran through a sliding glass door at 12 y.o. and had major lacerations, including an artery in my leg. I’m very wary around glass of any type!! I hope there is a pillow there for Clyde to land on!! Such a cute pony picture! This must be the time for windshield damage. I got a hit from a rock, too. Now I have two dings from rocks on my windshield. My friend was going down I-75 and her windshield was hit by a large piece of sheet metal from a construction truck ahead of her. Thank goodness there was a witness that stopped because the construction company tried to deny it. You know I gotta love that photo of you on the pony! So cute. I’ve been having a spell of breaking things, too, but at least they have been small ones. Those windshield breaks are always so annoying, though. And Clyde – be careful there.